Do you ever wonder how to continue to eat local and/or organic while away from Philly for business or pleasure? Many other cities in the U.S. and abroad also offer opportunities to eat fresh and local fare, so the table never feels too far away from its source. Over the weekend, while staying in Niagara-on-the-Lake, I had the pleasure of visiting Starfish Oyster Bed & Grill during a day trip to Toronto. In addition to the plethora of information provided online and in the menu on the restaurant’s sustainable mission, world champion oyster shucker and proprietor Patrick McMurray (who will be among the many chefs at the Toronto Zoo’s Seafood for Thought event) took the time to speak to me about Starfish's mission. 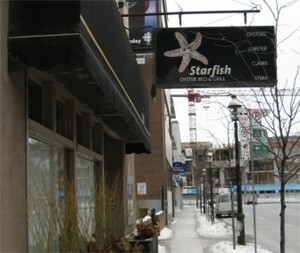 Starfish, which opened its doors 10 years ago, takes sustainability seriously and is very enthusiastic about its responsibilities as an eco-conscious restaurant. Whether eating seafood, or salad and other land food, it is easy to find out where the food came from. The very tasty salad I had featured greens from Kawartha Ecological Growers that were newly-plucked fresh. The main dishes were just as good. The P.E.I. mussels were infused with a hefty bite of garlic, and the Lake Huron pickerel was delectable. In addition to the food, the atmosphere and friend-like service made the experience evermore enjoyable. So, if you are headed to Toronto, stop by Starfish Oyster Bed & Grill for a scrumptious meal prepped and served by people who truly care about sustainability and the environment.